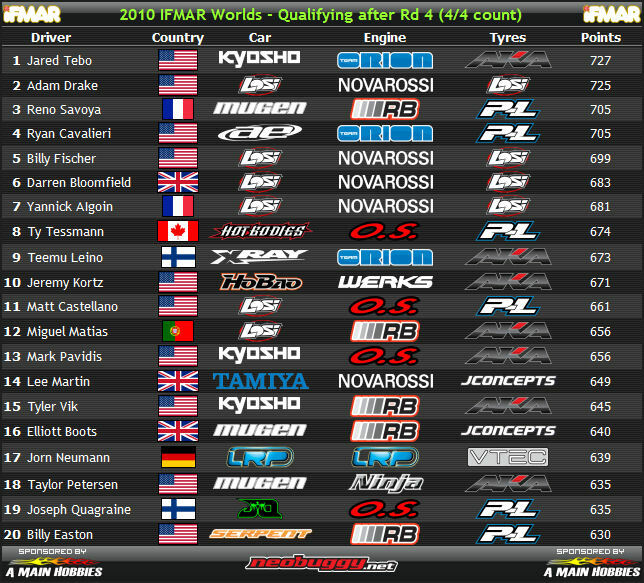 There are a few names after two qualifiers who are struggling – Mike Truhe in 48th after some unfortunate marshalling, Jesse Robbers in 139th after missing Q1, Jon Hazlewood in 117th, Greg Degani 111th, Ryan Lutz 105th, Taylor James 99th, Robert Batlle 90th, Martin Bayer 89th, David Ronnefalk 88th, Neil Cragg 84th, Cody King 77th. This is counting Q1 & Q2 so those who had a poor run or non score are way down in the listing. At the business end of things Matt Castellano is putting on a masterclass – lieing in 4th, the quiet Californian Castellano – who no one expected to be that high up let alone going fastest in timed practice. Miguel Matias is doing well in 9th – revitalised since his 3rd place @ the Euros this summer and 3rd highest Losi driver. Darren Bloomfield in 12th is the highest non-practice-r (yes that word doesn’t exist!) but respect to Tyler Vik in 15th – doing a great job. 14 year-old aussie Kyle McBride may turn out to be the fairytale story of the Worlds lets see, he’s in 22nd at the moment and seems like a lovely young guy, Worlds warm up winner Meen Vejrak is in 28th; highest home country driver.